Two generations of the Argenbright family lived in the log side of the Stone House for 93 years. There are some living at the time of this writing who remember when Nettie, the last of the Argenbright children, lived in the log side of the Stone House before she died in 1972. Some locals even continued to refer to the log side of the property as the “Argenbright house” decades after Nettie’s death. 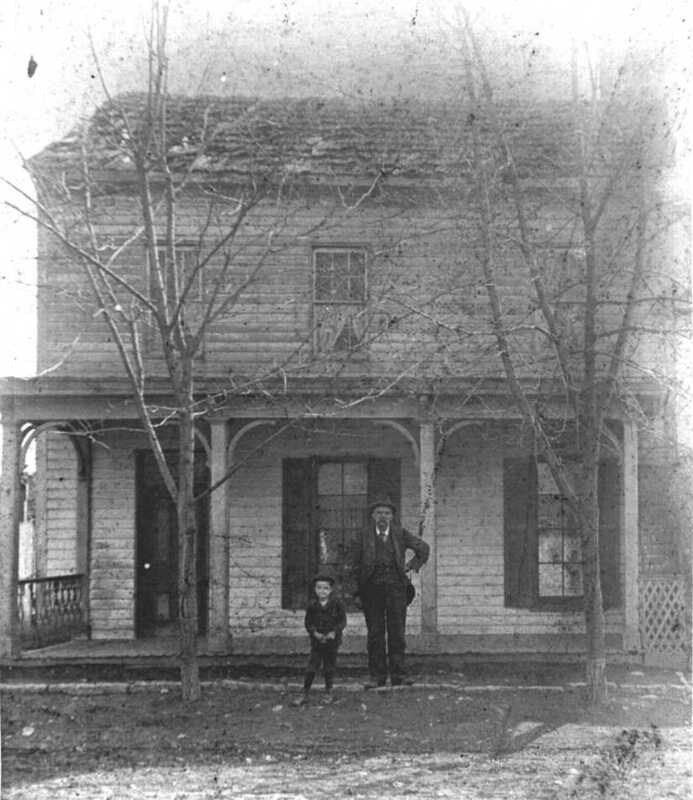 It all began on 30 January 1879 when Branson and Eliza Argenbright purchased the long side of the duplex from Henry and Lomie Dinges, who were moving up the street to their new home at 5387 Main Street. While Branson was working at his trade Eliza Jane was raising a growing number of children. The first child born to the couple was Bertha May who came into the world on 18 October 1871, eight years before they moved into the log side of the duplex. She was followed by Laura Virginia on 8 November 1873, Effie Constance on 7 December 1875, and Bessie Mabel on 7 June 1878. The first child to be born while the Argenbrights lived in the log side of the Stone House was Sadie Inez who joined her sisters on 15 August 1880. Jesse Holmes, the Argenbright’s first son, was born on 16 October 1882. Next came Mary Elizabeth who was born 26 September 1884, and Nettie Cordelia, the last of the Argenbright girls, who was born 11 February 1886. Branson and Eliza’s last child was Lloyd McClellan who was born 3 October 1891. Only four of these children eventually married. On 6 October 1897 Laura married Willie Boyd “Pud” Steele, the son of Mager and Martha Steele, and grandson of Mager Steele, Sr., the patriarch of the Steele family of Stephensburg. The ceremony was performed in Luray Caverns by the Rev. J. C. Thrasher, the minister of Stephens City’s Trinity Lutheran Church. Rev. Thrasher also performed the ceremony for Bessie on 20 December 1900 when she married C. W. Caldwell, a local dairyman. Lloyd moved to Harrisonburg, Virginia around 1915 and on 25 November 1917 he married Nellie Elizabeth Logan. After serving in World War I he settled in Harrisonburg with his wife and children for the remainder of his life. Bertha married a man with the last name of Brown. A note in the Argenbright family Bible states that Bertha died in Champlain, Minnesota on 15 February 1944. The remainder of the Argenbright family lived out their days in the log side of the duplex. Branson died 4 August 1910. Mary, who was handicapped, died 3 February 1924. Eliza lived with her remaining adult children until she passed away 1 January 1936. Sadie, who was mentally handicapped, died 28 March 1958. Holmes worked as a local house painter and wallpaper-hanger until he was hit by a car on Main Street in Stephens City and died 18 August 1958. Effie and Nettie were both school teachers and taught at the Stephens City School. Effie died 12 October 1963 and Nettie passed away on 20 February 1972 while she was still living in the log side of the property. The Argenbright heirs then sold the log side to Harold & Jean Patton who then leased it to tenants.